If you read other blogs about food like I do, and particularly ones where the blogger gives you an “insider” peek into their real kitchen (not the one they’ve tszujed up for the purposes of blogtography), do you ever find yourself, you know, judging? I don’t. Ok, I totally do. And I know you do too. I want to know why I spend so much time wiping, swiping, cleaning, and primping the kitchen when it looks like everyone else in the blogverse always has these super clean organized spaces. And the fridges! Always so neat and tidy when mine is so…sticky and fingerprint-covered. 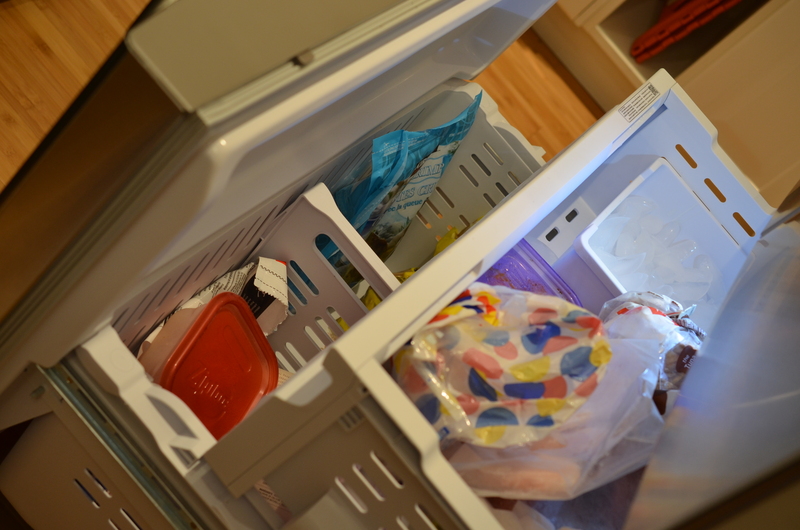 Well this post isn’t necessarily about that – but it is about the Story of My Fridge. In kitchen 1.0, pre-renovation to TCP, we had a fridge we hated. It was nice enough, stainless steel, 18 c.u. feet, and it came with the house. It appeared to be brand new when I moved in (lots of things appeared to be brand new but weren’t). It looked just like the fridge I had in my old condo, which I loved. But really wasn’t loveable like that one was. This one turned out to be a horrible bottomless food-spoiling monster that was a disaster to keep organized. I was determined not to have CTP fridge 2.0 have the same problems we always had with the food-spoiler and so I spent a lot of time researching different sizes, layouts, and features to make sure we made the right choice. The broken crisper drawers. Plural. The narrow opening, and deep shelves – meaning many many things lost. Many things. Mostly things that get mouldy. The bottomless pit of a bottom-freezer (love bottom freezers, but it’s all about the pullouts, which this one didn’t have). I don’t even have a picture of the old fridge (ok, it’s our new basement fridge, but I don’t want a picture of it, ok?). 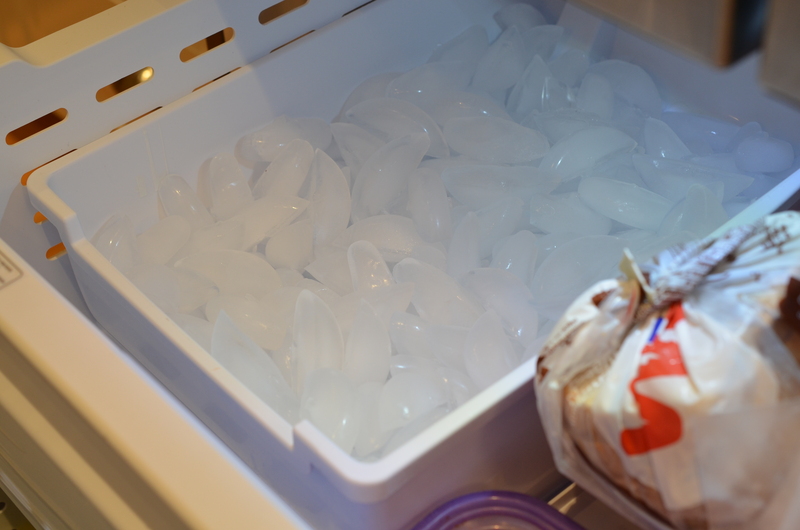 Two words: ice maker. Ice! Maker! Water dispenser (I was prepared to hate this, but I LOVE it). Water. Cold. When ever! Moveable shelf for when you have tall stuff. Right? Non-bottomless pit freezer. Pull outs! The planning around CTP 2.0 started 2 years ago and involved 3 key elements: bigger kitchen (a super-kitchen, if you will), separate bedrooms for the boys, and an office space that fit both me and the ECF (I hate sharing a desk). We coordinated with an architect and a builder. Everything was on track. The kitchen design was going to be my own. I set to work figuring out cabinets, dimensions, appliances, colours, you name it. I even had drawer inserts picked out. Kitchen 1.0 was a galley kitchen, and so it wasn’t going to be difficult to make the new one better than that. I worked from the architect’s dimensions, and designed a larger (much larger), L-shaped kitchen, designed around 2 things – a cool 6’x4′ island with seating, and the super-fridge. I had been dreaming about this fridge for a long time. And, as luck would have it, the Leon’s flyer that very week, the week I was doing most of the designing, had the dream fridge, on sale for a really great price. That very Saturday, the ECF and I headed over to see the salesman at Leon’s and order ourselves that very fridge. Please keep in mind that this was a year and a half ago. At the time, the reno was upon us, and we were starting as soon as the builder was available. The fridge was ordered that same Saturday and we were told it would take a couple months to come in, which suited our timeline just fine. The following Monday (2 days later), Leon’s called to ask when they could deliver the fridge. Wait. What? Apparently the fridge had been available all along, no wait. So I asked Leon’s if they could hang on to it. And then I fielded calls from Leon’s every month for the next 18 months – trying to put off the delivery. You see, the reno didn’t start when I thought it would, which was fine, but I really felt bad for the Leon’s people. I mean, they aren’t offering some kind of storage service. All of this was complicated by the dimensions I was working from when I designed the layout of the super-kitchen. They were incorrect. The cupboards arrived to the house and they builder started putting them together when I got the call. “You need to sit down,” they said. The dimensions I used were wrong. I had 4 inches too much cabinet for the walls that were available. Not a lot you can do for a work-around on that. It had to be redesigned. From scratch. This was not going to break me. No. I just sucked it up and got it done. The Super Kitchen became the Even Superer Kitchen. Slight delays. But this was not going to break me. When we finally had the flooring down and there was a spot to put the fridge in the living room temporarily during the construction, I called up Leon’s to have the delivery done. I took an afternoon off work, to wait for the truck during the delivery time-frame, and it showed up nice and early, which was great, only to be told that they weren’t comfortable carrying the heavy fridge up the temporary steps in the front of the house. No big deal, I am all about safety. The fridge stayed on the truck, in it’s packaging, and the delivery guys left. I felt bad. I tipped them. When we finally had overcome the obstacles you normally don’t have to overcome when you buy a fridge (no front steps, no floor in kitchen, no electricity, etc. etc. ), I called up Leon’s (finally!) to get this mother fridger delivered. And so they came. I had to take an afternoon off of work to be at the construction site, during Leon’s 4-hour delivery window. The delivery guys were great. They came, took the fridge off the truck, out of the packing, measured everything, and had almost started taking the doors off (necessary to get this monstrosity through our front door) when I saw them. Huge dents and scratches all over the front and side. The super fridge was a super dud. The fridge went back on the truck, and the delivery guys left. I felt bad. I tipped them. They had to order me another one. One that hadn’t been sitting in the warehouse for 18 months. I’m pretty lucky the model wasn’t discontinued. A few weeks later the second one arrived. Another afternoon off work to sit at the house and wait during the delivery window. These delivery drivers weren’t so nice. They got the thing off the truck, out of the packing, I checked for dents and scratches (none, yay! ), they took the doors off, and then they measured. This measuring tape must have been different than the ones the other guys used, because these delivery drivers weren’t prepared to try to get this fridge through the door. Oh. Come. On. Oh, and, no tip this time. But this was not going to break me. Ok, in case you have lost count, that’s 3 fridges. I’m a little bit superstitious. This fridge is cursed. I couldn’t do it. Even after the builder told us he would happily remove our front window and get his guys to lift the fridge through. No. This wasn’t meant to be. Even if they delivered the fridge, and the builder got it in, it was destiny that the thing would break down inside of a year. I couldn’t do it. We took ourselves back to Leon’s and got our money back. It was like an 18 month savings plan. This was not going to break me. Needed a different brand. The builder recommended we hit Sears. So we did. A lot of measuring (we weren’t going through this again) and a lot of door-opening, drawer trying, weighing of pros and cons, and we found our second choice. It was smaller. It didn’t have the same bells and whistles as the cursed fridge, but I needed to get it done, and with move-in day now looming after 18 months, I only had a couple of days to find something, so I was desperate. Another afternoon off. Another 4-hour delivery window. Another set of delivery guys slightly cranky about removing the doors and packaging and smushing the thing through a tiny little door frame. These guys measured and looked, and measured again, and as I watched from the front window and saw the looks on their faces – I knew… I just knew…this was going to be a problem. Again. Fridge 4. I was broken. The whole reno process was nearly done and I was able to keep myself together this whole time and it was going to be the friggin fridge that breaks me? Yes. Big racking sobs. A couple of dry heaves in the backyard so the guys working in the house wouldn’t see me. The Sears guys left the fridge on the front porch to sit overnight until my builder could show up to do the front window trick he promised me. Was I worried someone would steal it? Sure. It was a brand new 24 c.u. foot fridge sitting unattended on the porch of a vacant house. But the good news is, and what allowed me to drive away from the house that night, was that I would be able to find the thief pretty quickly. All I’d have to do is drive around the neighbourhood to see who had a fridge on their front porch. In the end, the fridge was brought in by our builder without incident. It’s a great fridge, we are so happy with it. It isn’t as big as the original super fridge, but it has all the bells and whistles.